The “British museum curator” is Jonathan Ferguson, whose work I covered in my “6 Reasons Why You Shouldn’t Buy an ‘Antique’ Vampire Killing Kit” (Oct. 31, 2014). Ferguson is actually the Curator of Firearms at the Royal Armouries, Leeds. 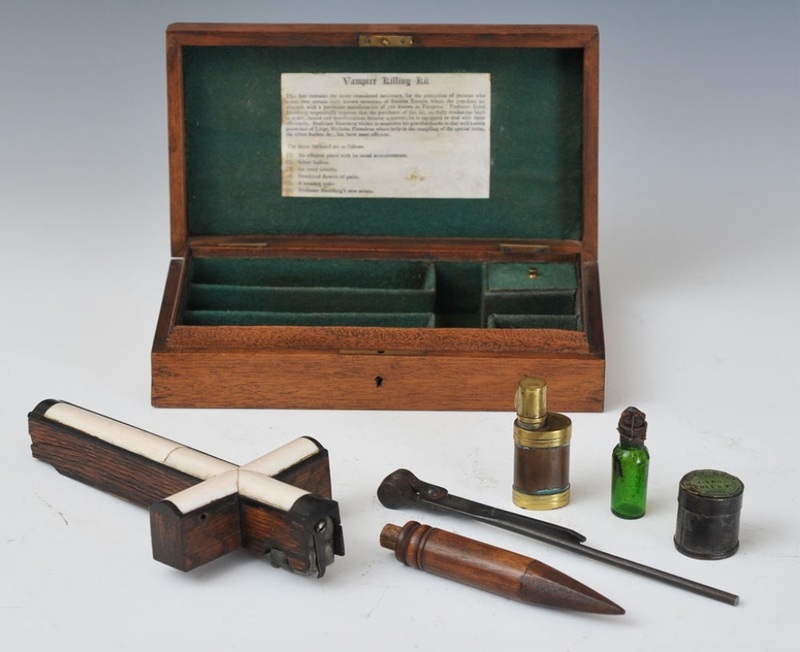 On Sunday, Nov. 9, Ferguson gave a talk about these “antique” vampire killing kits at the British Library. I decided to use my museum training to investigate these unusual pieces, in particular those labelled as having been created by a ‘Professor Blomberg’. It is usually stated that these, and vampire kits in general, are late-Victorian novelties or souvenirs, sold to tourists travelling to eastern Europe in the wake of the publication of Dracula in 1897. Some sellers and media outlets even claimed that they were made for believers in vampires, for self-defence purposes. I suspected that they were indeed novelty items, but were rather more recent than many believed. I conducted a survey of the folklore surrounding ‘real’ vampires, that is, dead bodies exhumed by a troubled community and ritually ‘killed’ as scapegoats for whatever malaise might be affecting people. Nowhere was there evidence to support real vampire slayers carting about one of these kits. I persisted, revisiting the fictional stories and movies of my childhood and beyond, noting the development of the various ingredients in the typical vampire killer’s toolbox. It became clear that the ‘Blomberg’ kits, with their focus upon silver bullets, were very unlikely to have existed prior to about the 1930s at the earliest. Though constructed from antique boxes and contents, they were most likely not produced until the era of the classic Hammer vampire movies. In other words, they’re fake: they weren’t made during the 19th century. I’ve been saying the same thing for years. That’s why it was so disappointing seeing another “antique” vampire killing kit up for auction so soon after I wrote my “6 Reasons” article. That article was inspired by the sale of two “antique” vampire killing kits on Wednesday, Oct. 22 through Sterling Associates, Closter, N.J. 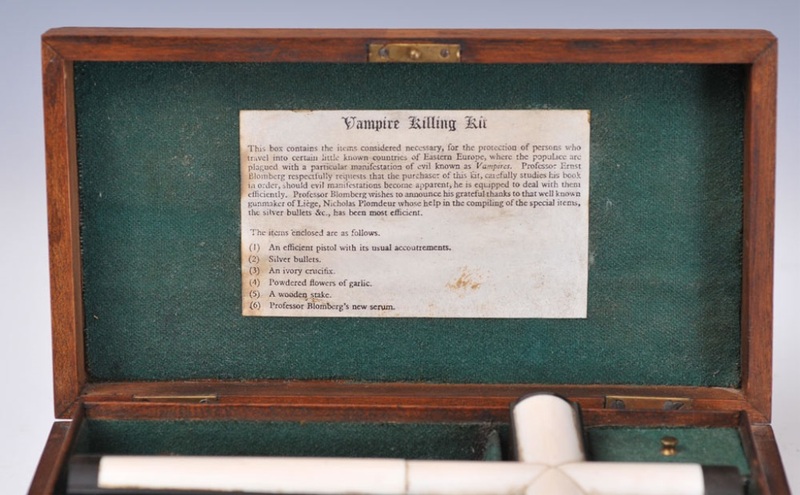 This article was inspired by the sale of “Professor Blomberg’s Vampire Killing Kit” through Fairfield Auction, Monroe, Conn. on Sunday, Nov. 16. “Professor Blomberg” is often associated with “antique” vampire killing kits because his name appears on inscriptions accompanying several kits sold through auctions or displayed in museums: “Professor Ernst Blomberg respectfully requests that the purchaser of this kit, carefully studies his book in order, should evil manifestations become apparent, he is equipt to deal with them efficiently.” Several variations of the “Blomberg” kits are catalogued on the Spooky Land website, but no kits are identical. 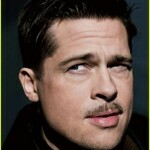 Posting on the internet does not make something a fact – especially since the three appearances of the Wikipedia biograpy [sic] (that I have found) on the internet are all cut-and-paste instances of the very same text. Someone attempting to create a ficticious [sic] person out of thin air might post such data to multiple websites to create a ‘depth of sources.’ The fact that this paper was written by another professor named Blomberg, living and working in the appropriate location, often within the appropriate scholarly circles (but a generation too late) suggests that serious efforts have been made to artificially add to the legend of Ernst Blomberg, vampire hunter. One example includes a scan of the title page and a few leaves from Prof. Ernst Freiherr von Blomberg’s paper, Ueber Die Verwandlung im Prinzipus: Thiere, Maenschen und Ihren Gottlosen Vereinen (1869) which appeared online. But the paper doesn’t exist: the scan turned out to be a doctored version of Rudolf Leubusher’s Ueber die Wehrwolfe under Thierverwandlungen im Mittelalter – Ein Beitrag zur Geschichte der Psychologie (1850). Hi there! You should know that all the quotes on your site are a load of codswallop. The reason is this: The whole VAMPIRE KILLING KIT myth is purely the result of my very fertile imagination and I produced “The Original” in 1972. Nicolas Plomdeur the Gunsmith in Liege and Professor Ernst Blomberg are not and have never been real people. Thanks for your prompt reply. I take it by “comparing to other Professor Blomberg sets with images” you mean you’ve compared other such kits, photographically. In that case, are you also aware there’s no historical evidence for the existence of a Professor Blomberg who manufactured such kits? Indeed, in 2005, an Englishman named Michael de Winter stepped forward claiming he invented the original kit in 1972, and has been copied by others ever since? I have even interviewed the world’s largest collector of kits, Ripley Believe It or Not’s Edward Meyer, who told me has no evidence of the kits existing before 1990. Indeed, other such kits have been found to have artificially aged components. Are you able to tell me more about the examination? I have written about these kits on many occasions and I haven’t come across a single genuine kit, in the sense of a Blomberg – or any other – 19th century vampire killing kit being assembled during the 19th century. If yours is, indeed, genuine, it would certainly help upend the notion these kits are actually elaborate hoaxes. Fairfield Auction has not replied to my email at the time of this article’s publication. My only consolation is that the kit sold well below their estimate: according to Bidsquare, the winning bid was US$3,000. The Bidsquare link has extra information not mentioned in the Fairfield Auction listing. Regarding the kit’s supposed inclusion of silver bullets: “Existing bullets are lead replacements. All other components appear to be original.” I think it’s far more likely silver bullets never featured in the kit in the first place. Consider the “silver” (pewter) bullets found in the Blomberg kit displayed at the Mercer Museum, Doylestown, Pa. (“Vampire Killing Kit Update!” Diary of an Amateur Vampirologist, Aug. 4, 2010). Be sure to check out Spooky Land’s excellent vampire killing kits page for more information. Of all “Blomberg” kits listed on it, I think the Fairfield Auction Blomberg kit most resembles the “Probable German Kit, ca 1895” [sic] sold through Fain & Co., Grants Pass, Wash., to an anonymous Seattle man for US$12,000 c. October 1997. Strauss’ “One sold for $12,000 at Sotheby’s” comment is likely a reference to the sale of “A Very Elaborate Vampire Killing Set” through Sotheby’s, New York, on Jan. 11, 1994. See “6 Reasons Why You Shouldn’t Buy an ‘Antique’ Vampire Killing Kit” (Oct. 31, 2014) for details. I would like to thank James Lyon, author of Kiss of the Butterfly (2012), for sharing the link to Fairfield Auction’s “Professor Blomberg’s Vampire Killing Kit” listing, which served as the primary inspiration for this article. Vampire Killing Stakes of Dubious Authenticity—Yours for Only $99.99! Thanks for the skeptical investigation of vampire killing kits. One thing that made me suspicious of these is that I’ve never seen one in poor condition, as though it had been left forgotten in an attic for 50 years. They all look well preserved. If the kits were genuine, you’d think some poor condition kits would turn up — possibly not going for top dollar, but still of interest to collectors or folklorists who couldn’t afford the most expensive examples. You’re welcome, David. I’ve written about these kits for a few years now and it’s great to hear other writers are getting the word out on their fakery. I have a vampire kit and want to confirm ? Can you tell us more about your kit? How you got it, what’s in it, and share some pictures, if possible? If you give me an e mail I can probably send you more details ?! If you give me an e mail I can probably send you more details ?! Or can you send to my e mail directly w/comments regarding the above ?